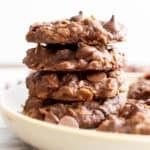 Gluten Free Trail Mix Cookies (V+GF): an easy recipe for chewy and satisfying protein-packed trail mix cookies, full of fruits, seeds and nuts. Vegan, Gluten Free, Dairy Free. Back in the day, when Erik and I were living in San Diego, we would LOVE to go on a hike. If you’ve ever been to SD, you know what I’m talking about. There are countless trails, beaches, bicycle paths and pretty much anything and everything an outdoor lover could wish for… like, everywhere. It was truly an adventurer’s paradise. But did I ever tell you why Erik and I moved there? It was because of the OG: my sister, Penny. She lived there first (she also went to Mount Holyoke first, trailblazer that she is), and she introduced me to so many wonderful aspects of San Diego. Some highlights: the San Diego Zoo (of course! ), Sunset Cliffs, Crystal Pier and most importantly, the hiking hotspots: Cowles Mountain and Torrey Pines. You guys, I’ve never been on a better hike than the hikes on Cowles Mountain. It is so tough getting to the top. Alright, confession time: it might’ve been just a tad (really, just a tad) bit harder for me since I wasn’t the most active college student at the time. Ahem. And I’m like, “Yes, it is. Please, go ahead of me. There’s no need to play games. None, whatsoever.” ? As Penny runs circles around me (ya know, to warm up), I’m putting on my best bravado and hoping these aren’t the shoes that pinch. How would I know? I’ve only worn them like twice. I pretend to know what I’m doing with my stretches, which honestly, are the same ones I saw Billy Blanks do in the 90s when I was a kid. Then, I have myself a little giggle, thinking about how awesome Tae Bo was. Correction: IS. At long last, it’s time to start moving. Okay, this is not so bad. There’s just the tiniest incline on the way up. No biggie. After a few minutes, some kids start passing us and many long-limbed-surely-training-for-the-Olympics adults whiz on by, too. Penny is very patiently matching her pace to mine. She even tries chatting with me, the dear. My lungs are burning and at least a dozen people in walkers have passed me by. Make that at least 2 dozen. But I can’t give up. Not under any circumstances. So I slow my pace, no longer preoccupied with the energy it takes to talk and walk. I start slowing down my hammering heartbeat. I climb over one clump of rocks, then circumvent a slippery incline. And then, another. More kids, walkers, Olympians pass me by. Penny circles back and forth, keeping her heart rate up, while I try my darnedest to keep mine from exploding outta my chest. Every time I want to give up, I think about getting to the top. I think about telling that little, often-made-fun-of-for-being-overweight-kid in me to that I’m gonna do us proud. I think about how my amazing sister Penny didn’t use to be athletic at all. How her sheer will and determination motivated her to change. And I keep climbing. Kids, fitness commercials, ants and even rocks pass me by. My lungs, my legs and even my fingers are burning. But it’s starting to feel good. Really good. Every time I start to give up, I see my sister just around the bend. And I know that I can do it. I feel a swoosh of sweat, wind and sheer superhero energy pass me by. Literally, Superman has just flown past me. With a baby carrier. And a dog on his back. Or something. But that doesn’t even matter. I don’t have a baby. I don’t even have a dog. SO there! What’s up now, Superman?!?!? And just as my back starts to ask questions, and my shoes start filing their resignation, I see something. It’s blue, it’s green and it’s dotted with blurry speckles. I keep moving. One leg forward, and then the other. Suddenly, things level out. And my sister is grinning the biggest grin you’ll ever see. Except for this time. The top of Cowles Mountain is breathtaking. Has there ever been a better reward for not giving up? Atop that mountain is a 360° view of San Diego. You can see everything. And it is beautiful. Blue skies stretch as far as the eye can see. Trees, mountains, and water all surround and nestle the people of San Diego. My sister and I laugh and hug, sweat and burning lungs forgotten. She claps me on the back, hands me a water bottle, and says nothing but everything with that twinkle in her eye. We both take a deep breath and just enjoy the view. Then, we start planning the rest of our outdoor adventures for the week: a walk over Sunset Cliffs, a trip to the mall (okay, that kinda counts—outdoor mall, ahem), a run at Mission Bay and so much more. I can’t say enough words about how wonderful it is to be supported and believed in. Especially by the people you love. It doesn’t matter if you’re dreaming about taking a cooking class, being an astronaut one day, or psyching yourself up to do a new workout. Just give it a try, and know that I’m here and so are many people in your life, who believe that you can do it. 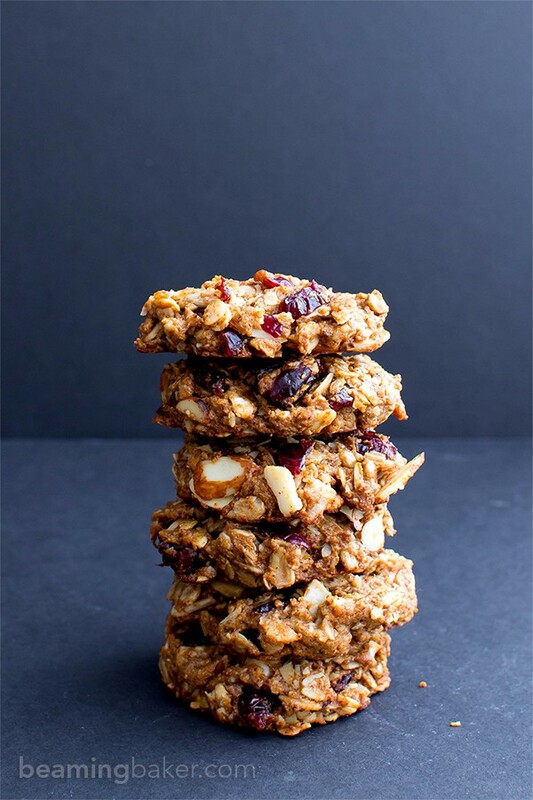 With that, allow me to dedicate these Gluten Free Trail Mix Cookies to my sister Penny, and everyone else who lifts someone up, or needs a little lifting themselves. 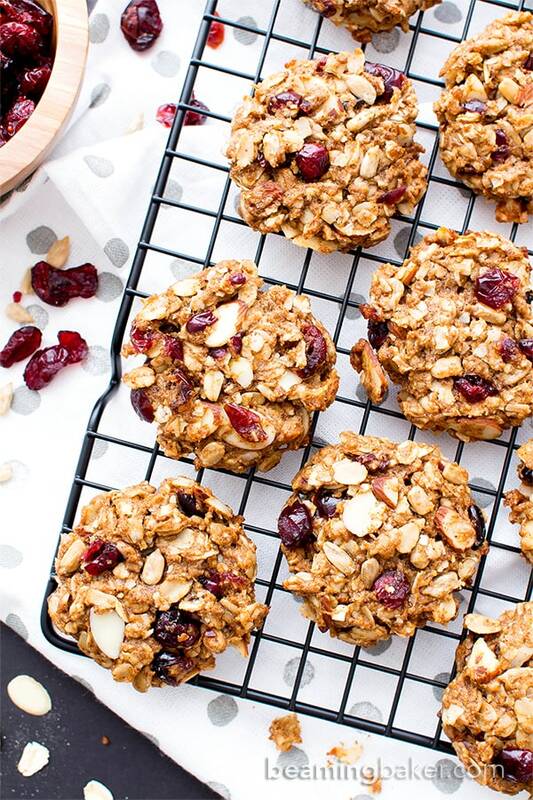 🙂 These cookies will keep you fueled and, most importantly, keep you going with good vibes and support. What do good vibes and support taste like? You tell me. So whaddya say? Will you climb a mountain today? Or maybe try something new that you’ve been thinking about? Life is so much more fun when you take a chance. Tell me all about something you’re daunted by, but quite curious about trying—whether exercise-y or not. When have you accomplished something you were sure you couldn’t do? In a large bowl, whisk together the dry ingredients: oats, flour, coconut, cinnamon, baking powder, baking soda and salt. In a medium bowl, whisk together the wet ingredients: flax eggs, coconut oil, almond butter, coconut sugar and vanilla. Whisk until smooth. Pour the wet mixture over the dry mixture. Using a rubber spatula or wooden spoon, stir and fold the ingredients together until well combined. 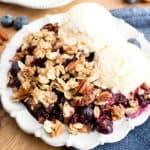 Fold in cranberries, almonds and sunflower seeds. 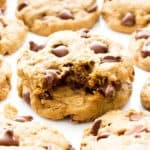 Using a 2-tablespoon cookie scoop, scoop 2 tablespoons of cookie dough onto the prepared baking sheet, spaced evenly apart. 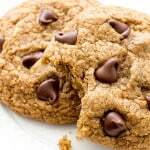 Using a fork, gently flatten cookies to desired thickness. Cookies won’t spread during baking. Using a flat, heatproof spatula, immediately remove cookies from the sheet and place onto a cooling rack. Allow to cool completely before storing. Enjoy! - Adapted from my Good Morning Breakfast Cookies. 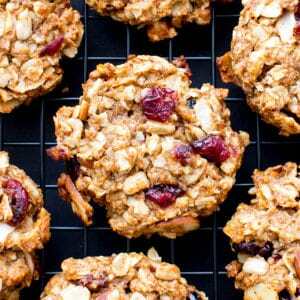 - More protein-packed snacks to keep you going all day: no bake snacks, cookies, smoothies. - Here’s the fantastic cookie scoop that I used in today’s recipe. Word on the street is that you love a good snack. 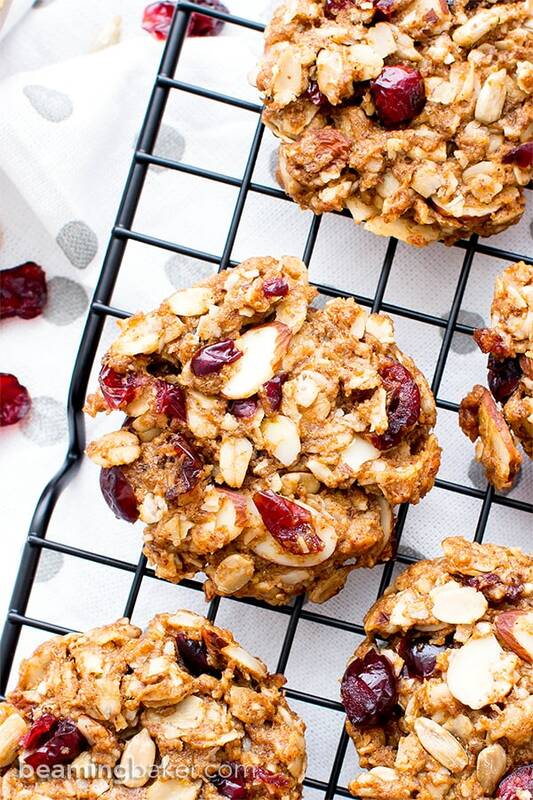 Try my No Bake Cranberry Coconut Energy Bites (Vegan, Gluten Free, Dairy Free). Delicious, healthy and so easy to make. Cookies: the answer to life’s hungriest questions. 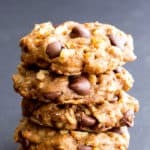 😉 Try my Almond Butter Chocolate Chip Oatmeal Cookies (Vegan, Gluten Free, Dairy Free). Full of simple ingredients and fantastically scrumptious. My daughter and I went to San Diego about 5 years ago for Comic Con (yes we are quite the nerds) and while we didn’t hike all the hot spots, I have to admit – it is a fitness lovers dream – if cost of living wasn’t as crazy there as in Atlanta, I wouldv’e moved for sure! On a serious note, way to go persevering in your climb – I love hiking here in the North Georgia Mountains – for me hiking has been such a truly humbling and exhilirating experience! Aw, haha! That was such a sweet tale! I think I need to move to San Diago! Those are my people! Warmth, exercise, sunshine…yes please! I’ve never been to San Francisco before, but would love to go! Sounds amazing! I regularly work out, about 5 times per week. It’s definitely part of my routine now and I do enjoy it 🙂 I don’t often exercise outside, but when I do go for a walk, it’s usually just leisurely. High five to you for hiking and doing it! I’ve heard that often times our mind gives up before our body does when exercising. You go girl 🙂 !! 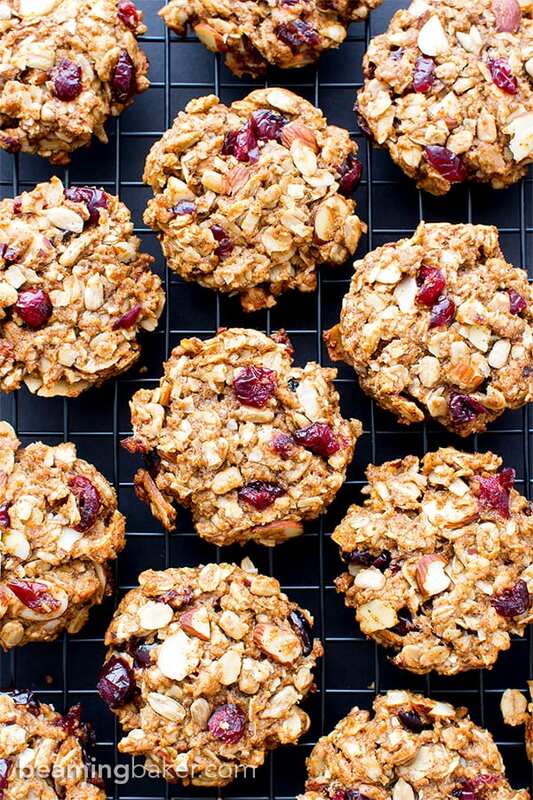 These cookies look delicious…so chocked full of goodies! I would totally go for a sweaty hike in order to get a bunch of these, Demeter! Promises of food always gets me, lol 😀 Pinned, of course. Oh my! I remember you saying San Francisco before. Obviously, I read that wrong. Ugh. Is it Friday yet 😉 ?? So funny that everyone keeps mentioning SF. This time, I was talking about San Diego. 😉 Thanks so much Puja! I love your story. It was such an inspiration! It really is so important to have people support us in our lives. I totally imagined you hiking up Cowles Mountain! I have hiked that trail and it is no joke! It is REALLY steep! San Diego is truly stunning. One of the prettiest places I have visited. All the nice weather, palm trees, and water everywhere. And you are right! San Diegans love to work out outdoors! 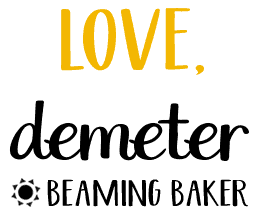 Hi Demeter, lovely story and congrats on making it to the top. I think sometimes we have to push hard and almost fall out of our comforts and lungs to achieve something, whether a climb, a new venture etc. I used to run kilometers up[on kilometers, the beginning excruciating but then something happened freedom and will combined with sheer exhilaration and a 5 km run turned to 15. 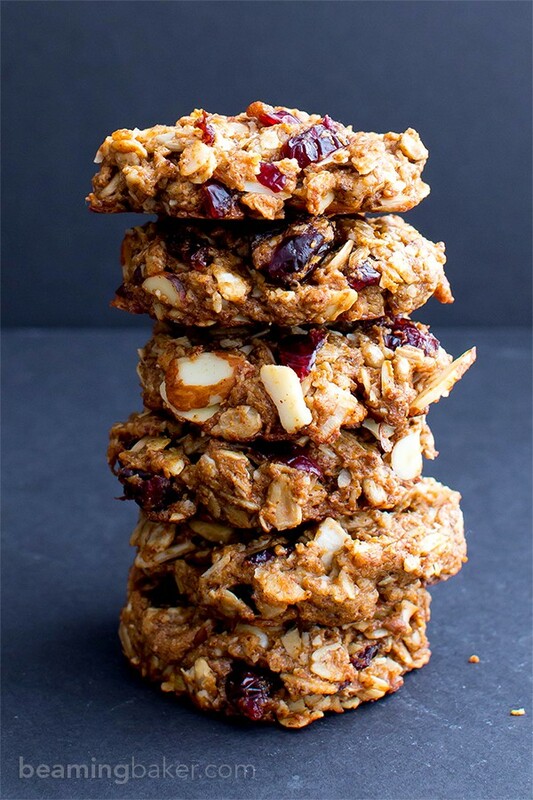 The trail mix cookies are fantastic, the perfect thing for that trail hike and I love trail mix, just dumping handfuls into my mouth and chewing and tasting those wonderful flavors. What a great post and story I was laughing and cheering at the same time. You to have a great weekend.. P.S. San Diego sounds amazing have to check it out. I love San Diego! I’ve only been there twice, but it’s on my list of places to go back to, and soon! And I definitely need to try hiking next time. Sounds like you had a blast, despite your rocky start. 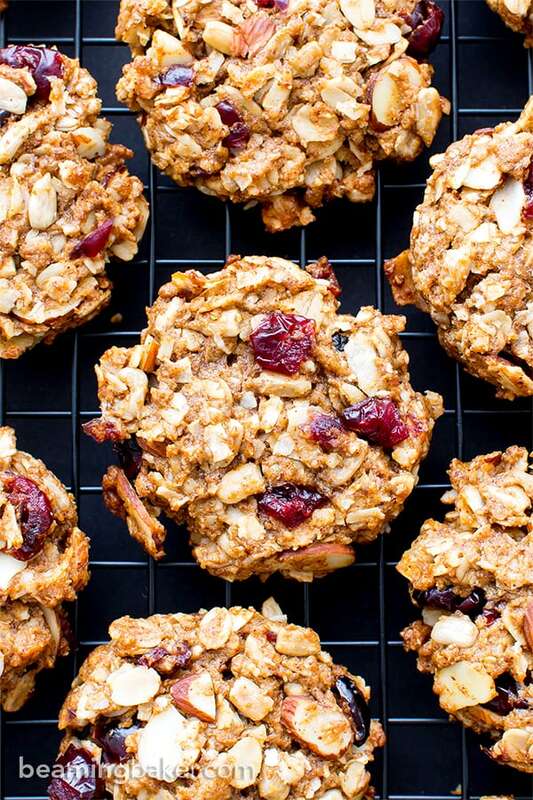 And these cookies…oh my word do they look GOOD! So perfect for climbing a mountain, and by mountain, I mean walking around my neighborhood haha! 🙂 Love how thick and full of flavor they are! Pinned, of course! Hope you have a wonderful weekend! Nothing gets me ready for the week like an inspirational story like this one 🙂 Getting out to the west coast is on my bucket list, I’ve been an east coaster my whole life and while I do quite enjoy it, I know there are so many cool things out there! 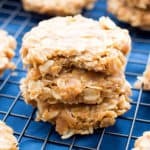 Trail mix cookies sound absolutely fabulous – healthy energy snacks in cookie form?! Sign me up! Lolol. Whoops! Sorry my friend. 😉 What could be better than making it to the top? 😉 Of course, sweet baker’s dozen for a sweet friend. 😉 Thanks Annie! 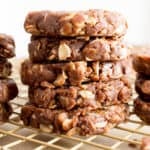 I can’t have ground flaxseed, would replacing the flax eggs with applesauce work? Greetings from Australia! 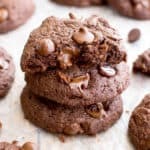 I love your website and have made these cookies twice. They are delicious but the second time I made them, the cookies crumbled really badly, ie. they almost fell apart. Any ideas on what I am doing wrong? Your site is fabulous and your stories are wonderful! I just had a cookie for brunch with coconut yoghurt and raspberries!! Hi Nicki, I’m waving back to you from Boston, Massaschusetts! ???? So they worked out the first time? Did you make any substitutions? Also, did you allow the flax eggs to set until they gelled up? (I’m going to go ahead and change the setting time to 15 mins on the recipe to make sure!) Hopefully we can get this figured out. 🙂 Thank you so much for your sweet note. Hugs! Thank you for your sweet and prompt response. The only modification I made was to cut down on the cranberries and added a few soaked prunes and dried apricots. I always make my own crackers and use linseeds and I find they seem to gel better than using ground linseeds. Sorry, we call them flaxseeds here in Australia. I did notice notice both times that the ground gel did not seem to “gel” too well. I did leave it longer than 10 minutes to try and make it gellier – haha. What a silly word!! Anyway, they taste delicious, and crumbly doesn’t affect the taste. Still, I would really like them to remain whole. They look better!! Big hugs back to you. 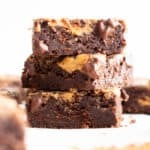 I cannot wait to try more of your recipes – they are great, and I collect recipes from hundreds of sites, but I am very impressed with yours. Add-ins: I think the issue here might be the size of your add-ins. Make sure the prunes and apricots are almost finely chopped. If they’re too large, the cookies won’t stay together. Also, make sure you measure the quantity too. Too much and the cookies won’t stay together. These are SOOOO delicious! I make these all the time. This time around, I didn’t have enough almond butter so i used half almond butter, half cashew butter and it was just as good. I also used 1/2 cup raisins and 1/2 cup white chocolate chips only (no nuts or seeds) and I loved it. 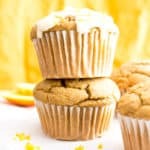 Thank you for a wonderful and flexible recipe! That’s fantastic Grace! I’m thrilled to hear how much you enjoy them. ???? And those add-in combos sound totally delish! I am just back from an overseas holiday where my “no process sugar rule” went out the door! I am in desperate need of making these delicious cookies again. I forgot to mention last time that I used chia seeds instead of flax seeds. Could that have caused the cookies to crumble? I am a huge fan of chia seeds and usually make a coconut milk cacao pudding for brunch. Thank you for so many wonderful and delicious recipes.